The Company currently owns and operates, through its wholly owned subsidiaries, eleven self storage properties located in Connecticut, Illinois, Indiana, New York, Ohio, Pennsylvania, and South Carolina. 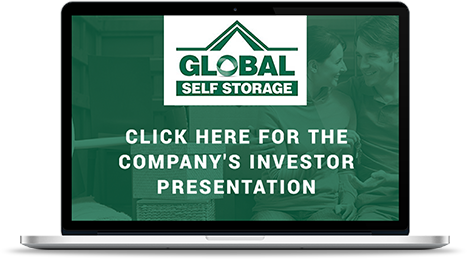 Global Self Storage, Inc. is a self-administered and self-managed real estate investment trust ("REIT") focused on the ownership, operation, acquisition, development and redevelopment of self storage facilities in the United States. Our self storage facilities are designed to offer affordable, easily accessible and secure storage space for residential and commercial customers. The Company currently owns and operates, through its wholly owned subsidiaries, eleven self storage properties located in Connecticut, Illinois, Indiana, New York, Ohio, Pennsylvania, and South Carolina. The Company has paid dividends every year since it was founded in 1983.
redevelopment of self storage facilities in the United States.